If you love the thrill of the festival vibe but are seeking something new this year then look no further than This Is Tomorrow Festival. This exciting one day event is set to make its debut at Spillers Warf, Newcastle on the 25th May. Kicking off at 17:00, the open air event promises a huge night of fantastic acts including indie rock bands, Everything Everything and Little Comets. Headlining are NME nominees for Best British Band and Best Live Band and winners of Brits Awards, British Break Through Act: Catfish and The Bottlemen. Inspired by the late, great Richard Hamilton, an English painter, collage artist and lecturer who inspired artists and musicians alike. The name, This Is Tomorrow, is taken from Hamilton’s famous Pop art exhibition showcased in 1956. Today the exhibition remains widely recognised as being one of the first of its kind. 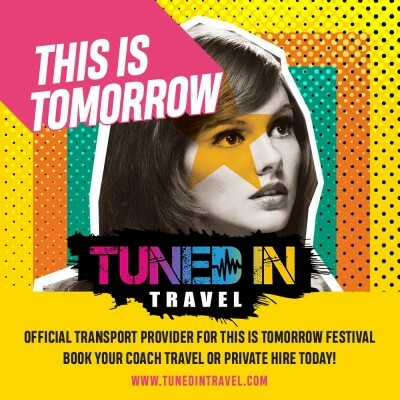 Get ahead of the game and book your transport now with Tuned in Travel! As the official and exclusive transport providers of This Is Tomorrow Festival, we have everything covered for you. Ensure your group travel together in style by booking one of private hire vehicles. With set prices for sixteen seater vehicles, you and your group can relax knowing door to door pickups are available for at affordable prices. If you’re travelling in a smaller group or making your way to the party solo then book a seat on one of our comfortable public coaches going from: Durham, Carlisle, Sunderland, Hexham, Leeds, Manchester, Middlesbrough and York. If you can’t find something to suit your travel needs simply get in touch with our customer service team via customerservice@tunedintravel.com for a free quotation. Tuned in Travel are proud to be in collaboration with the festival initiative, Energy Revolution. Together, we aim to balance your fossil-fuel travel miles to This Is Tomorrow with direct investment into clean renewable energy projects. Donations can be made when you book your travel, 100% of which will go towards creating clean energy.